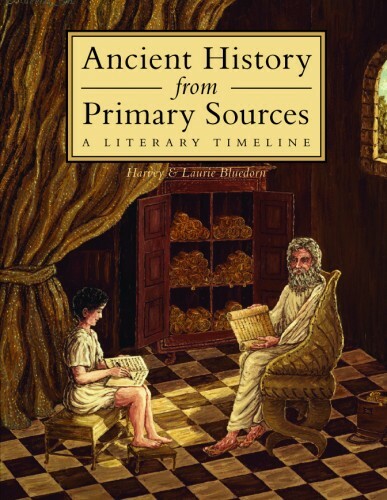 Ancient History from Primary Sources: A Literary Timeline by Harvey and Laurie Bluedorn is on sale this week. Normally priced at $29, this week you can buy it for $16. Plus, with your order you will receive (upon request) Ancient Literature — Significant Excerpts From the Books of Classical Authors Which You Can Use to Supplement Your History Curriculum — all six ebooks (normally priced at $15). Ancient History from Primary Sources is a reference book which guides the student on a selective timeline tour through ancient history, outlining the major events and personalities, and noting the primary literary sources from which these things are known. Time-wise, this book covers the period from the creation of the world to the fall of Rome in A.D. 476. Space-wise, this book covers the civilizations of the near east and west. Each event or person in history is accompanied by suggested readings from various ancient sources. This book will lead you by the hand through the maze of ancient literature and help you find what is appropriate for you and your children to read as you pursue your study of ancient history. Generally speaking, the classical literature we cite is suitable for students ages twelve and up. Some of the literature is suitable for younger students (Aesop, some of Xenophon, Plutarch, Quintus Curtius, Gellius, Josephus and several others). See the rest of this review here. This entry was posted on Thursday, February 7th, 2019 at 6:44 pm	and is filed under History, Trivium Pursuit Sale. You can follow any responses to this entry through the RSS 2.0 feed. Both comments and pings are currently closed.